Halloween is upon us and let’s keep it safe, not scary this year. Here’s 10 Halloween safety tips for parents! 1. When picking costumes, make sure the costume isn’t blocking any of your child’s visibility. Consider using face paint instead of a mask to ensure they will be able to see clearly at all times. Hem any costume that is too long for your child. Make sure their shoes fit well and are comfortable. You don’t want your little ghouls tripping and getting hurt! 2. It’s also a good idea to decorate costumes with reflective strips so that cars will be able to easily see your child walking. Also have your child carry a flashlight. 3. Review street safety with your child. Remind them to only cross the street at corners/crosswalks (no jaywalking!) and to look left, look right, and then look left again before crossing, and continue looking while crossing. 4. 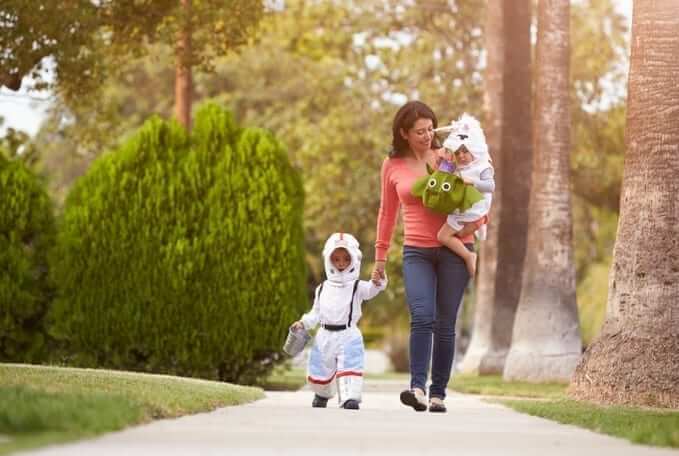 Stick to familiar, well-lit areas for trick-or-treating and walk on sidewalks whenever they are available. 5. Make your pets feel safe and comfortable by keeping them away from trick-or-treaters and loud noises. Costumes, loud noises, or constant knocking can scare pets. If you have an especially nervous pet, consider booking them a doggie staycation. 6. If you live in a neighborhood with a lot of trick-or-treaters, consider putting a sign out in the street to notify drivers they are entering a Halloween hot spot. Hopefully drivers will slow down and proceed with caution. 7. Young trick-or-treaters should always have adult supervision and older kids should trick-or-treat in groups. Explain the importance of not separating from the group as well as entering a stranger’s home. If you have an older child who will be trick-or-treating with friends, it’s a good idea to discuss a “in case of emergency” plan. 8. Halloween candy is the big pay off of the night but kids and parents should always inspect their treats before diving in. Never eat something that appears to have been opened and you may want to skip homemade treats. 9. As always, if you are leaving for your own Halloween party, lock your windows and doors and remember to turn your alarm on! 10. If you see something, say something. Whether it’s Halloween pranksters messing with your neighbor’s house or a reckless driver on the road, report all incidents to local authorities.